What I will share is a couple of things. First, you can get a great tutorial for this technique by going to Red Heart. They have a really nice free afghan project you can download that you make using Corner to Corner. Secondly, I found a great tutorial video by The Crochet Crowd for those who learn better by watching. You can find it on YouTube. One thing that I am very pleased about it how quickly I caught on to the technique. While it may seem confusing at first, the pattern is actually very easy to do. I also loved that the dishcloths took very little time to make. I am now considering making a small blanket using the pattern, possibly a baby blanket to give as a gift. Learning this new technique is giving me the confidence to try more new patterns. Even though I learned to do basic crocheting nearly 30 years ago, I still am very timid about trying new techniques or patterns. I have a few that I am very comfortable with and have used off and on over the years. Finally, I’ve reached a point in life where the crocheting is very relaxing to me and I am wanting to branch out a bit more in it. I am already planning out the crocheting needed for next winter. Both Little Miss and I need new shawls and the beds can all use a new blanket. Then, there are the holiday gifts to be made. I am sure that at least a few of the things made will be incorporating corner to corner crochet. 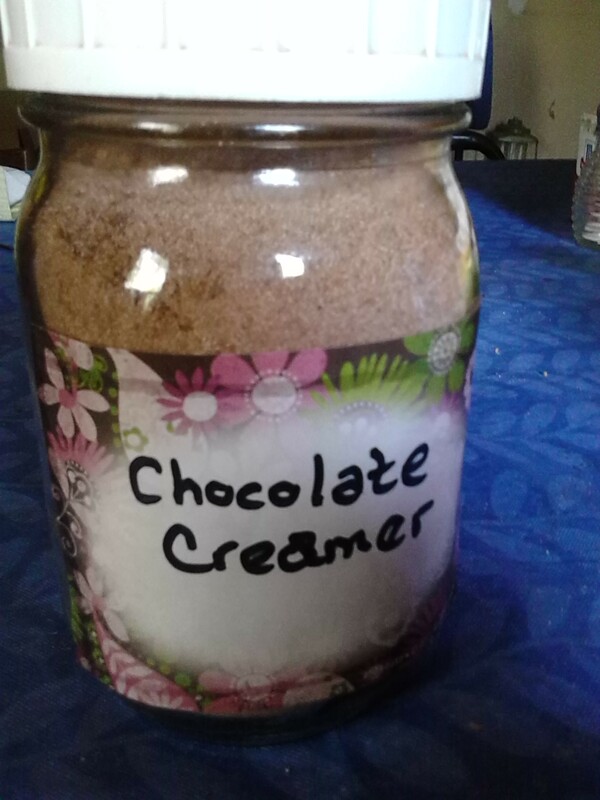 Here is a really simple recipe for a chocolate flavored coffee creamer. So much less expensive than the store bought and a more chocolate flavor. In a bowl, mix all ingredients until well blended. Pour into a jar or airtight container.